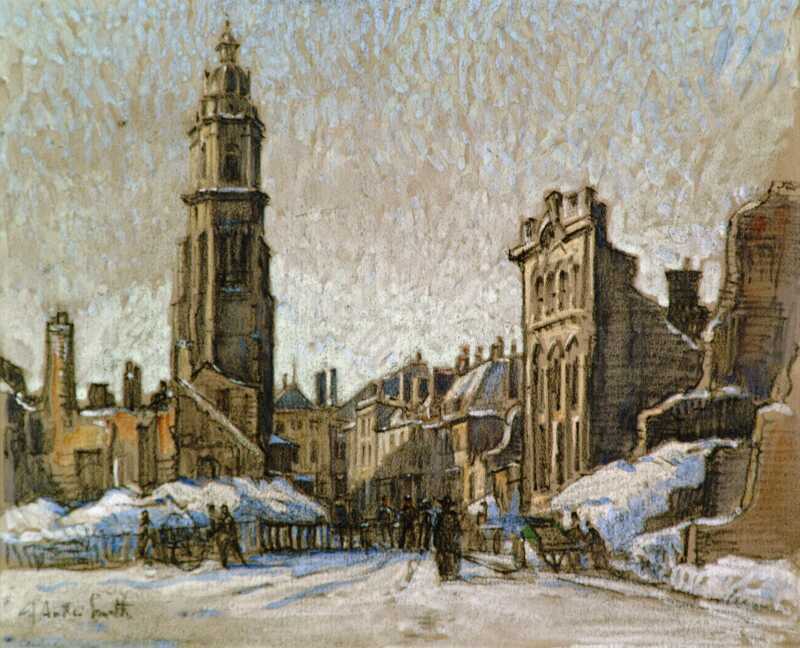 Cambrai during the war: pastel by A. Smith. This is the twelfth part of a series that starts here and alternates with other posts. Once the brigade had pushed through the Hindenburg Line, Reitz took advantage of being off duty to roam a short while about the vicinity, looking through his field glasses at the movements of troops. He could see flames rising from Cambrai, four miles away, and he watched as Allied troops advanced toward Graincourt and captured it in a burst of heavy fighting. When he returned to the 1st R.S.F., he found General Fisher waiting for him with the news that the 7th Shropshires had lost their colonel, and that he was to become their C.O. He was sorry to leave Bissett and other friends in the Fusiliers, but he remained in the same brigade and only had to walk a short distance to take over his new responsibility. The 7th Shrops. 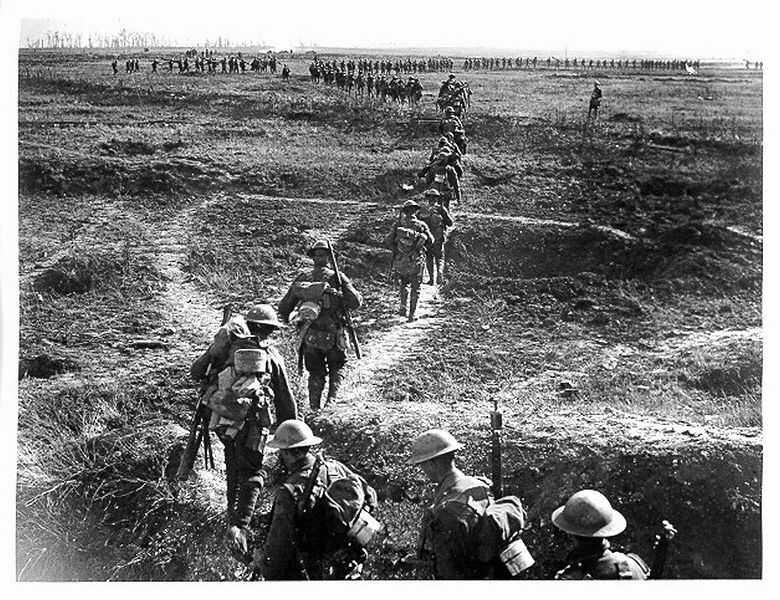 were ordered to march to a ridge several miles south of Cambrai, which the Germans were still vigorously defending. “We were faced with the novelty of having to bivouac on a bare hillside without trench or shelter. The men were new to this kind of thing… they were at a loss, and stood about helplessly.”* The scene must have been amusing for Reitz, who had spent the three years of the Boer War fighting on the open veld without so much as a tent most of the time. 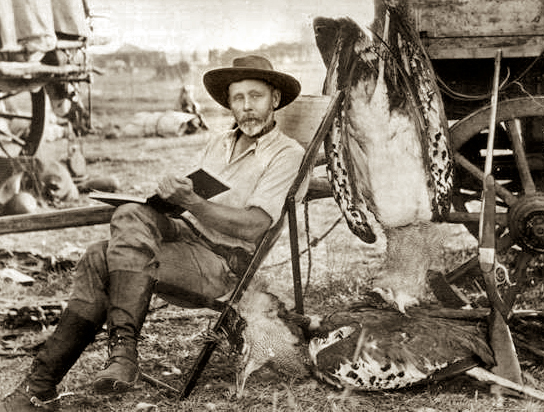 Reitz was certainly a skilled hunter, though he was not a collector of trophies, and his experience in big-game hunting was largely limited to teaching his two boys in the 1930s how to hunt lion. He had grown up reading the books of the famous hunter Frederick Selous; strangely enough, he actually met Selous during his stint fighting in German East Africa. Selous was killed by a German sniper just a few months later, January 4, 1917, on the Rufiji River. Here, near the villages of Marcoing and Masnieres—south of Cambrai—the men of the 7th Shropshires exchanged their parapets and firesteps for features of the open landscape that came to be imbued with intensity and, more often than not, mortal danger. These were the harrowing places that were dealt out as in a deck of fortune-telling cards: the bridge at the Canal de l’Escaut, the cellar beneath the Masniere chapel, the Crevecoeur sunken road, an abandoned German trench named with seeming irony “Mon Plaisir.” (The name was that of a nearby farm.) The sunken road would turn out to contain the same sort of horror as another famous sunken road, the one at the Battle of Shiloh. From September 28 to October 8, the 7th Shrops. were engaged in a series of actions preliminary to the main battle of Cambrai, fought October 8-10 (not to be confused with the Cambrai battle fought in 1917). In this new, less structured form of combat, they and the 1st R.S.F. were joined by a battalion of New Zealanders, while the third part of their own brigade, the 2nd Royal Scots, seems to have been swept off in a different direction—Reitz doesn’t say. 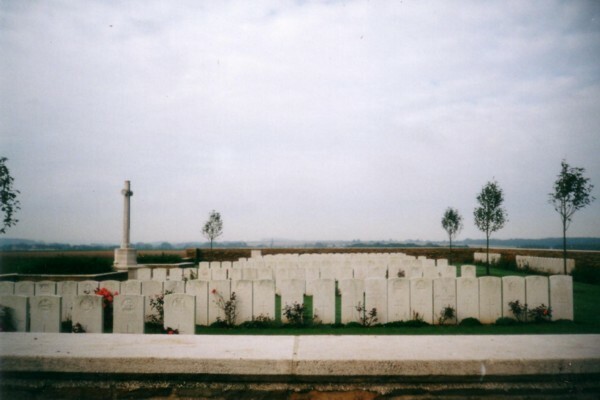 Just outside the village, men of two other regiments, the King’s Own and the Gordons, were suffering heavy losses as they hunkered down in the “Mon Plaisir” trench. The Germans were firing on them from the nearby sunken road. That night, the Shrops., the 1st R.S.F., and the New Zealanders routed the Germans from the sunken road. Orders came for the C.O.s of the battalions to take some runners and explore the position just beyond in preparation for a possible attack on the next villages, Serinvillers and La Targette. As it turned out, the enemy were present in such strength all the way between Masniere and Cambrai, that it was decided an attack on Serinviller would be suicidal for the brigade on its own. They returned to the ill-fated sunken road, which was still being pelted relentlessly with shells. 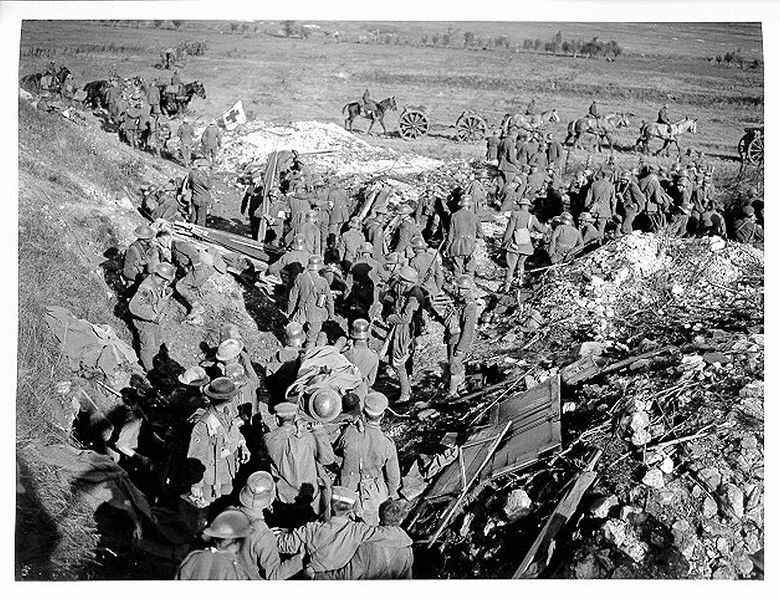 Bissett was still there, surviving yet, and now Shaw was able to get a team of bearers to carry him out of danger. Perhaps they would be able to catch up with him later. Now came a pause of more than a week while troops of the 2nd and 4th Armies were brought forward in preparation for dislodging the Germans from the vicinity of Cambrai. “We had the usual narrow escapes while holding the line, and I was once ill for forty-eight hours from gas poisoning, followed by a headache that lasted for days.” Reitz and Shaw decided to see if they could find out what had happened to Bissett. After considerable detective work, they learned that he had been taken to a casualty clearing station at Crevillers. On October 6 the C.O. of the brigade lent them a car to go see him. “I could not speak for fear of breaking down”: nowhere else do you see those words in the writings of Reitz. Bent Arm manway is an unmaintained path that connects the Miry Ridge trail at Dripping Springs Mountain with the Cucumber Gap trail near Elkmont. 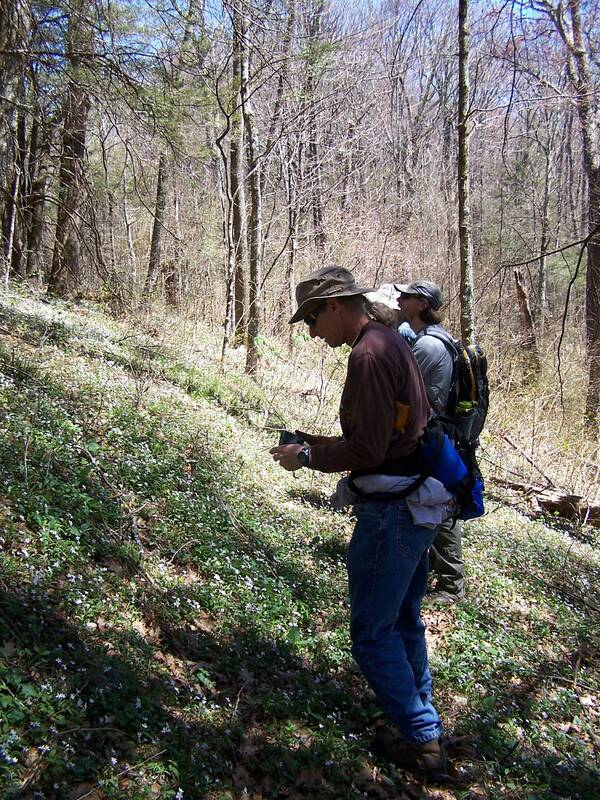 On this outing of the Smoky Mountains Hiking Club, a dozen hikers waded through ankle-deep wildflowers along the manway. 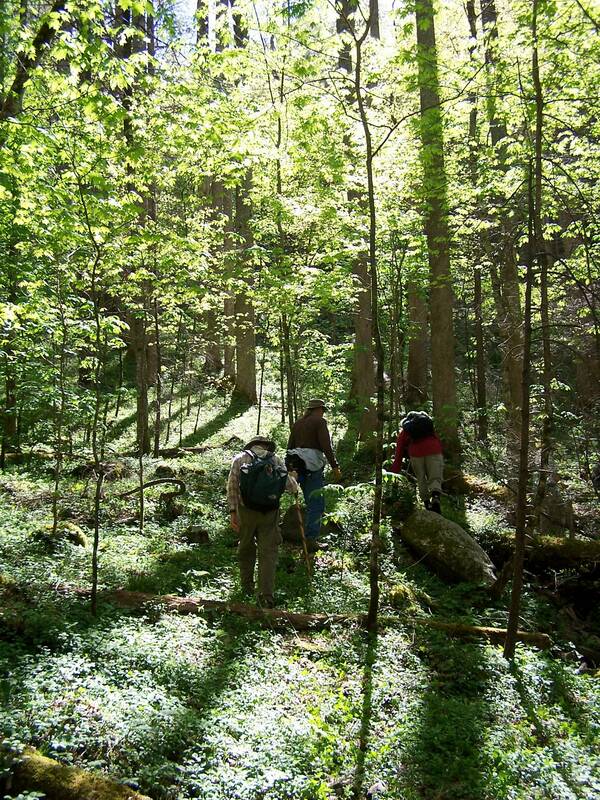 Under a beaming sun, the forest floor was waking up and coming alive, sending up flowers here—there—everywhere! We had all the necessary ingredients for a perfect spring day. Sky of robin’s egg blue—check. Plenty of warm, benevolent sunshine—check. Temperatures that rose from an invigorating chill to something you could bask in—check. Trees unfurling their delicate green leaves—check. Flowers? Yes, flowers: spring beauties, anemone, phlox, squirrel corn, trout lilies, foamflower, white, purple, yellow violets of every size, shade, and height, and trillium: two or three white kinds, a painted one, family groupings of yellow ones, one or two kinds of red. Check. 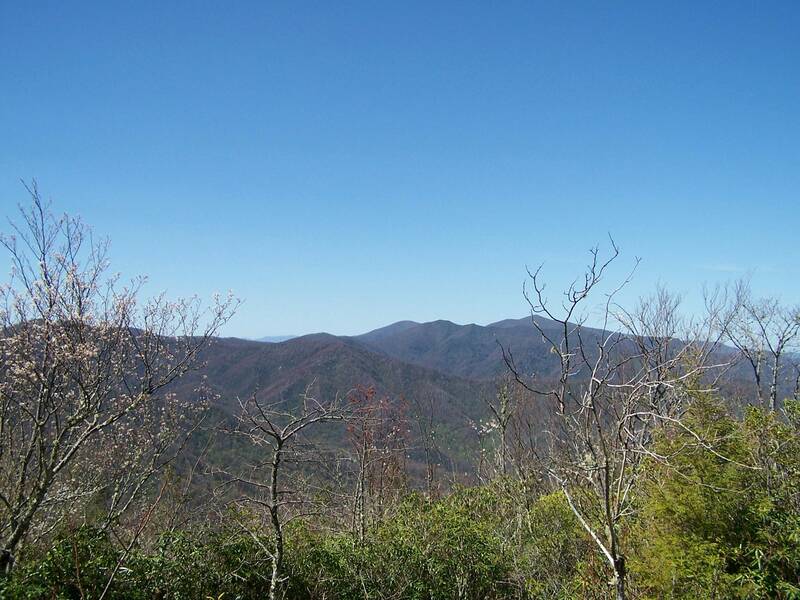 Our leaders had decided to do the manway from the top down, so first we climbed up from 2300 feet at the Jake’s Creek trailhead to 4800 feet on the Miry Ridge trail. 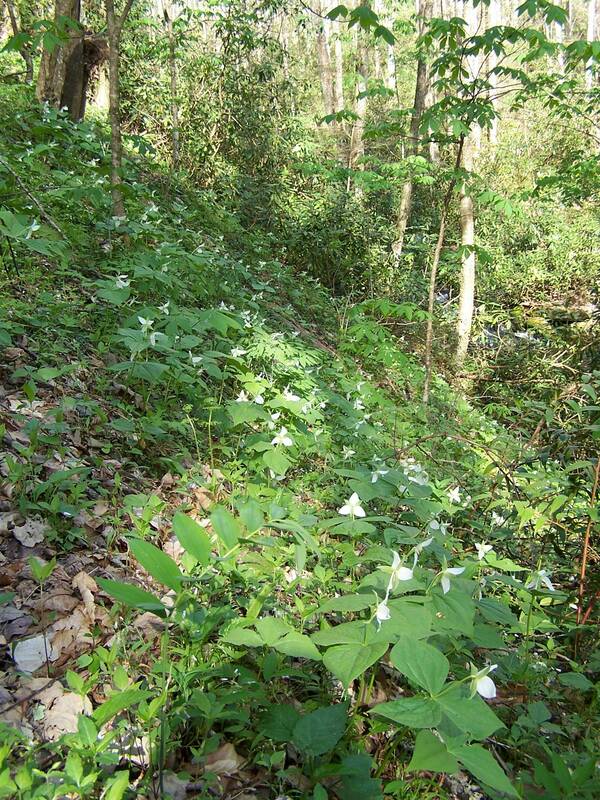 We passed banks of trillium. 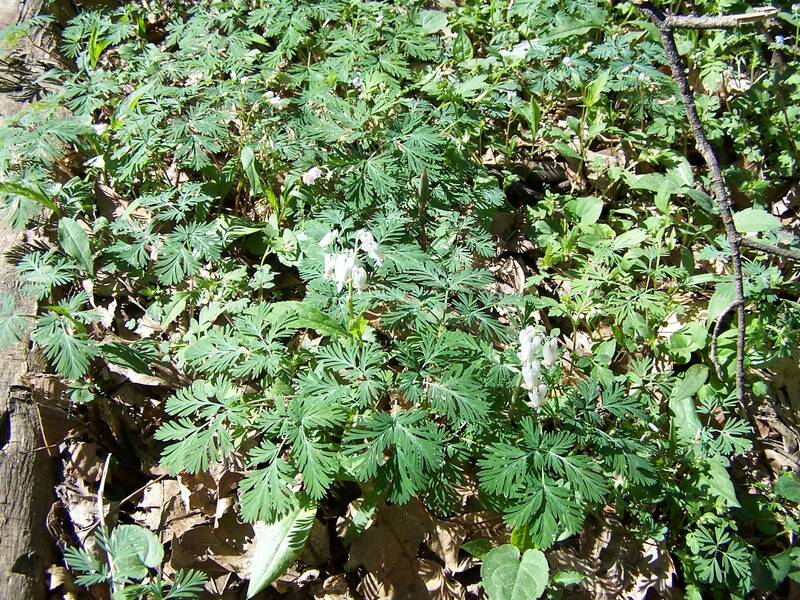 I noticed some squirrel corn, with its beautiful fringed dark green leaves. Our group stopped for a snack at campsite 27. 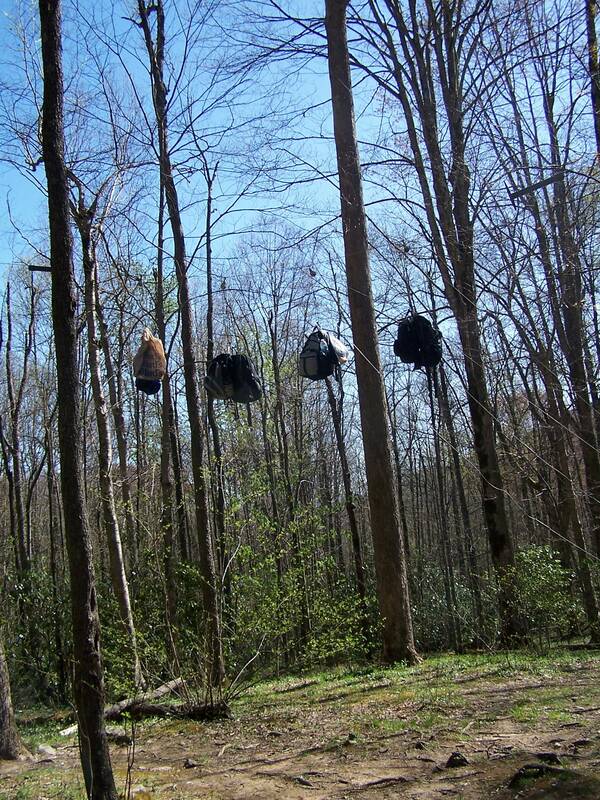 Just about all of the Smokies backcountry campsites have hardware for hanging packs and bear bags. Too bad for hungry bears! We turned onto the Miry Ridge trail and continued climbing until we reached a patch of heath where you get good views to the main stateline ridge. Through the luminous sky, we could see Thunderhead off to the right. 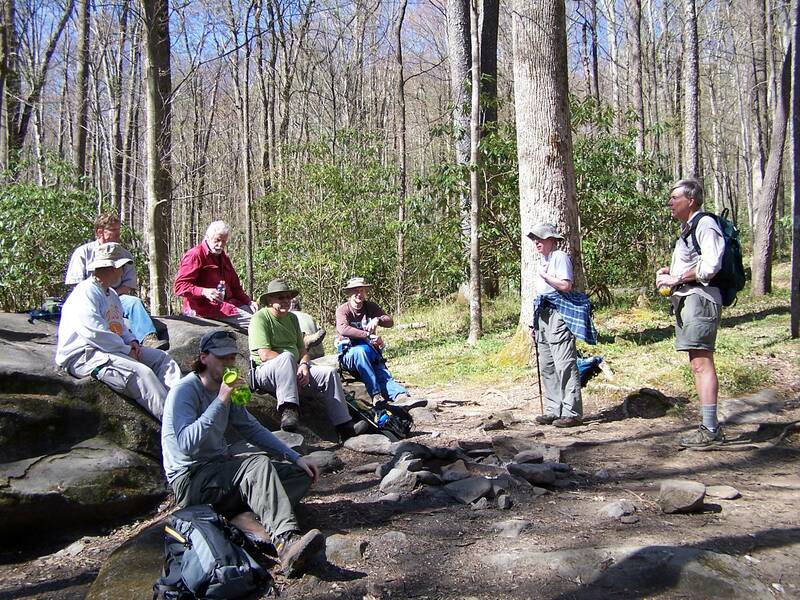 Before long we reached the point at the east end of Dripping Springs Mountain where the manway bears off to the north. It isn’t hard to see where the old trail was cut into the slope. The manway in the upper section stays on the right side of the ridge or on the ridgecrest. 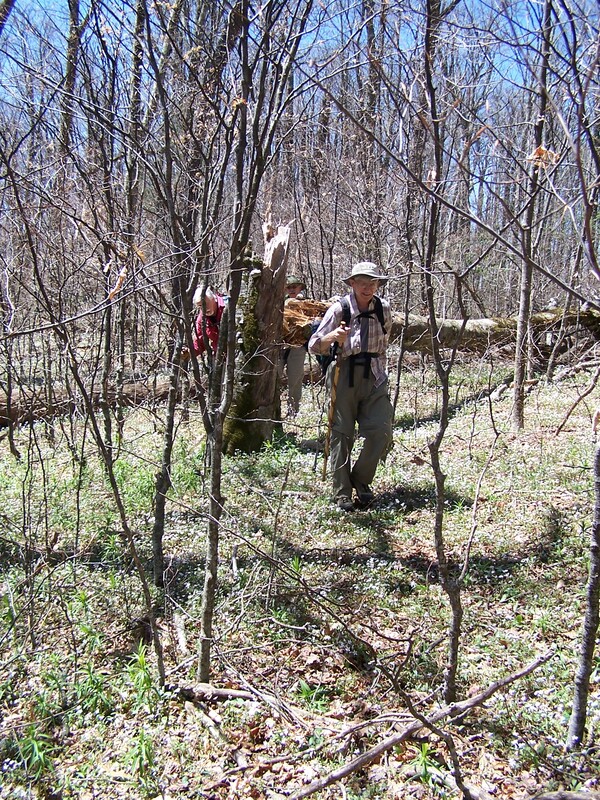 There are patches of greenbrier and some blowdowns, but the going is relatively easy. There was a period of slight confusion at a point around 4400 feet where the manway drops down on the left side of the ridge. We dropped down too far and missed the path where it sidehills, but after the usual consulting of maps and people hallooing through the woods at each other, we climbed back up and found the distinct bench where the path was contouring across the slope. 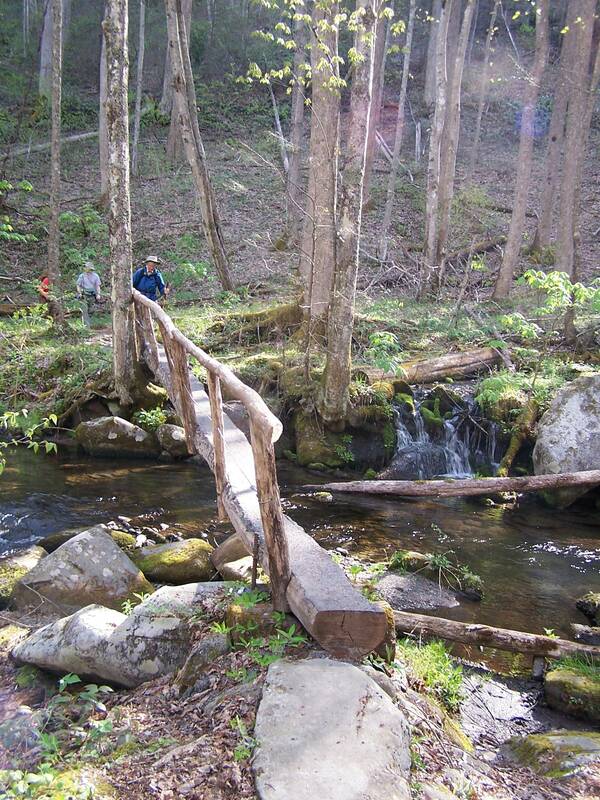 From there we reached a gap and followed an old CCC trail with rockwall construction. An old map shows the Bent Arm trail crossing over the gap and staying on the right side of the ridge, but the grade we followed continued on the left side for quite a while. Perhaps there were two different routes in the past. 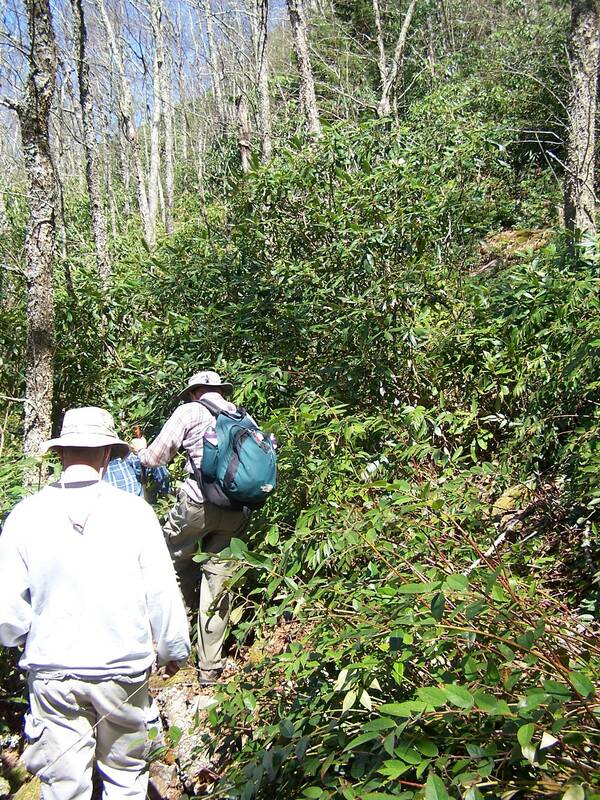 This section had some fairly thick rhodo and dog hobble. But lower down we got back into open hardwoods. We reached the Cucumber Gap trail about 1.5 miles from where it leaves the Jake’s Creek trail, and completed the loop back to the cars. This is the eleventh part of a series that starts here and alternates with other posts. The wound to his leg was more serious than the injuries that had kept him out of action November 1917 – February 1918, the recuperation more difficult. Many of Britain’s wounded soldiers were being treated at improvised establishments in private homes; the first time around he had landed at an imposing country estate near Salisbury, where he played rounds of bridge in the evenings with the local gentry. This time he spent three months at a small home in London owned by a patriotic Scottish lady. The nurses sometimes wheeled him in a bath chair to Hyde Park so that he could see the American troops marching past in encouraging numbers. Perhaps their addition to the equation would end the stalemate at last. Reitz spent two more months on light duty at Fort Matilda, for his leg was not sufficiently healed for him to return to the trenches until September 12. When he finally rejoined the 1st R.S.F., he found that very few officers or men had survived from his earlier stint. During the five months he’d been away, the Allies had pushed back in a series of offensives and, with great difficulty, regained possession of the ground all along the front that had been taken by the Germans in March. His battalion had suffered such heavy losses that Reitz found only George Bissett, his good friend, and two lieutenants remaining among the officers he’d known. Bissett now led the battalion; Reitz was second in command. The next goal: to break through the Hindenburg Line in a single major assault. Bissett was just the sort who would aggressively seek out the small moment of humor that surely lurked somewhere amidst the general mayhem and chaos. Unfortunately, the forces of mayhem were soon to make Bissett their target. The problem for Reitz, though, was that divisional headquarters had ordered the second in command of each battalion to be held in reserve in the attack, “as a nucleus for reconstituting the Battalion in case of heavy losses.” He does not spell out his reaction, only mentions—just in passing—that he made a special trip over to divisional H.Q. the next day to see General Fisher. “He insisted on my obeying orders, but agreed to my request that I be allowed to take up some coign of vantage from which to witness the attack…. I considered that the best spot for making use of the General’s permission was from our parapet.” The parapet of the trench, that is. When I first read this passage, it sounded oddly familiar. It took me a while to place the association. We have to go back to Doornkop, southwest of Johannesburg, on May 29, 1900. 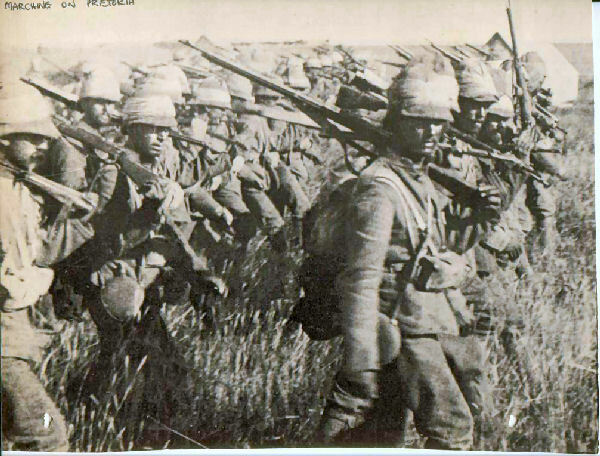 The British army under Lord Roberts has been advancing steadily toward Pretoria, capital of the Transvaal Republic. Earlier in the war, the British suffered disastrous losses when their troops advanced in a tightly packed herd toward positions held by well-hidden Boers. Now they are going to do it differently, in open formation. As an 18-year-old Boer boy named Deneys watches from a perch behind a rock, Mauser rifle in hands, the infantry under Ian Hamilton makes its advance. A British soldier named L. March Phillipps described it. In the larger view, of course, it was the superior numbers of the British that won them this battle and allowed them to continue on to Pretoria. Yet nothing can diminish that simple remarkable walk, that calm and steady walk, toward the enemy position. This time, Reitz is the beneficiary of the disciplined and courageous infantry advance—not the antagonist. 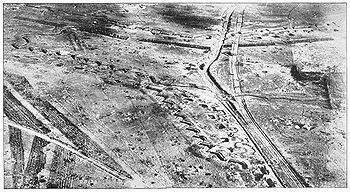 Within a day, the British had broken through the massive defenses of the Hindenburg Line, and a new phase of warfare was about to begin. It would take place in open country beyond the bloodwashed trenches where the conflict had been deadlocked for the past four years. * All quotes except the final one are from Trekking On. In The Trilogy of Deneys Reitz, Wolfe Publishing, Prescott AZ, 1994. # L. March Phillipps, With Rimington, Edward Arnold, London, 1902.